This week on the web has been an emotional rollercoaster, what with The Gos becoming a dada, Margaret and David breaking our hearts (why, WHY!) the shocking news that most of the population is single (in the US, at least)… We're about ready for a stiff drink and a back rub. Until you're contractually allowed to take a load off, have a well-earned mental relax with our favourite links from around the web this week. Yes, The Gos is officially a pop pop, which is good news for DILF fans. As with all that he touches, we know he'll take to fatherhood like a spunky duck to water. Here are 6 reasons Gosling's going to be a rad dad. Now that Ryan's off the scene, and Clooney's been raving about the joys of married life like a well-dressed lunatic, Prince Harry has officially taken top spot on our list of the world's best bachelors. To celebrate his 30th birthday, here's his baby album. Nothing weird about that. It's not just you! Turns out everyone is single right now. We may have found the solution to your Tinder addiction. Instagram of the week goes to Passenger Shaming, an account dedicated to the bozos who don't respect personal space boundaries on aeroplanes. Is it just us, or do New Yorkers get everything? They get Brooklyn, a seemingly limitless supply of fried chicken and waffles, and their very own real life Central Perk to buy their coffee from. They also have a NUTELLA BAR. No fair. 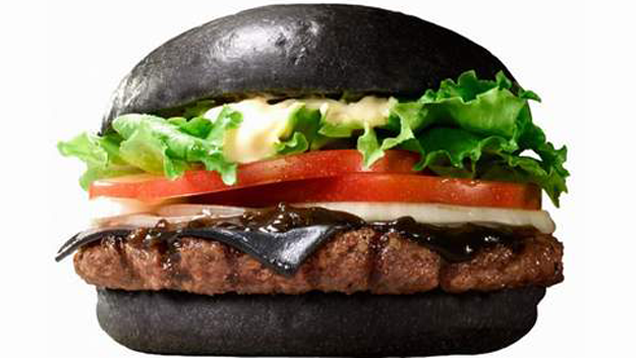 Japan, on the other hand, gets black cheeseburgers.